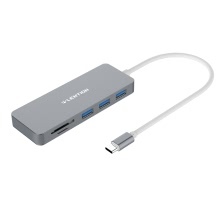 With USB 3.1 Type-C connector, you connect your MabBook Pro, 2015 MacBook 12&apos;&apos; or other PC, phones with USB 3.1 Type C connector. 3 USB 3.0 female port allows you to connect USB disk, drive, USB charger, mouse, keyboard, for data sync and battery charging. And One TF card slot and one SD card slot allow data sync and transferring. USB 3.1 Type-C, newest connector, can be plug positively and negatively. It&apos;s perfectly compatible with notebook ,tablet PC, computer with USB 3.1 Type C connector. 3 USB 3.0 female port allows you to connect USB disk, drive, USB charger, mouse, keyboard, for data sync and battery charging. One TF card slot and one SD card slot allow data sync and transferring. Only TF card or SD card can be read once, not simultaneously. Nothing but the craftsmanship spirit that makes the converter high quality and fine appearance.